The old deal made rough sense. The United States would provide only a very thin social-insurance cushion for people of working age, but jobs would always be available. Critics might deride the jobs as McJobs: often poorly paid, often offering scanty benefits. But better McJobs than No Jobs. To anyone who proposed tighter job protections or more generous social benefits workers came the crushing answer, "Do you want us to be like Europe?" While American generated tens of millions of low-wage service jobs, the economies of Europe struggled hard not to lose jobs, even during good times. The tradeoff was patiently explained by free-market economists and is by now familiar to us all. More job rules mean less jobs; fewer rules will bring more jobs. And for a quarter-century, from 1982 until 2007, the old deal held true. Wages didn't rise much, but demand for nurses' aides, fast food servers and other low-wage service workers surged and surged -- so much that for the first time since 1913, the United States again found itself welcoming a mass immigration of poor people, arriving legally and illegally from Guadalajara and Guangzhou, eager to accept America's abundant $9-an-hour jobs. Then, suddenly, the old deal broke down. It broke down as abruptly, as utterly and as seemingly irretrievably as a previous old deal broke in 1929. Mass and long-term joblessness characterize the U.S. economy of 2014 as surely as plentiful low-wage jobs characterized the U.S. economy of 15 years ago. Look at the output statistics, and the United States has recovered from the crisis of 2008. Look at the job numbers, and it seems the United States never will. What are Americans to think of and do about their new economic dispensation? One answer is to deny that the dispensation is new at all. Republicans in Congress are working to repeal the emergency job benefits put in place in 2009, on the familiar theory that if we quit paying the unemployed, they'll stop being unemployed. Extended unemployment insurance coverage lapsed on Saturday; 1.3 million long-term jobless lost benefits that day, and those still receiving benefits will lose them if they remain without work for longer than 26 weeks. Food stamp coverage has been cut once and will probably be cut again in 2014. Proposals to raise the minimum wage gain no hearing in the Republican-majority House of Representatives, whose members condemn such proposals as job-killers. Yet these familiar arguments bump into an unfamiliar situation. Almost six years after the economic collapse of 2008, the ratio of job seekers to unfilled positions -- which peaked at 5.5 to 1 -- has declined to 2.9 to 1, a ratio that would until now have indicated severe recession. The huge backlog of unemployed workers exerts downward pressure on the wages of those still working. The old employment deal seems a formula for a massive write-off of the great majority of working Americans lacking specialized skills. 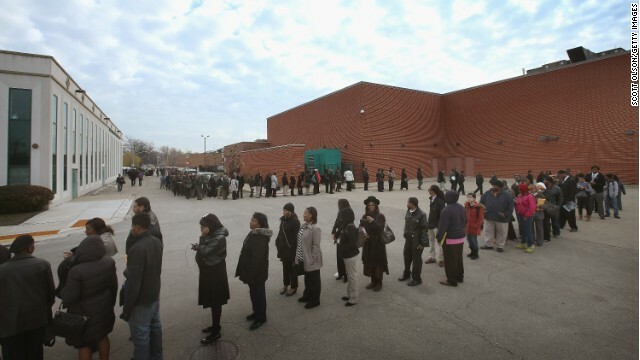 Last Saturday, the extension of unemployment benefits originally passed at the outset of the economic crisis expired. The position of Democrats in Washington, backed by a growing mountain of economic research, is that macroeconomic and humanitarian considerations alike both argue for an extension of unemployment benefits. The position of Republicans in Washington is rather strange — less a moral or economic argument than an expression of indifference. "These have been extraordinary extensions, and the Republican position all along has been 'we need to go back to normal here at some point,'" argues Representative Tom Cole. “[W]hat we did was never intended to be permanent. It was intended to be a very temporary solution to a very temporary crisis," echoes Representative Rob Woodall. Of course nobody intended for the crisis of mass unemployment to last five years. Nobody intended for the crisis to happen at all. It is simply weird to argue that, since the problem has gone on longer than intended, the response to the problem must end as well. The fire trucks don’t shut off the hoses simply because the fire should have been put out by now. Yet the weirdness, far from being random, reveals something deeper at work. The most obvious thing, of course, is a general lack of concern for the fate of the unemployed — or, at least, a casual assumption that the unemployed themselves must be to blame for their plight. But even a more generous reading of the Republican position, taking its most serious defenses at face value, reveals an intellectual hollowness. Half a decade into the economic crisis, the Republican Party has no serious ideas about the Great Recession. One of the few Republicans to directly defend his party’s refusal to extend unemployment benefits is Rand Paul. Unfortunately, as is so often the case, Paul’s ideas about unemployment insurance are cracked. Paul has repeatedly cited studies that show that employers discriminate against job candidates who have been out of work a long time. Paul simply assumes that people are staying unemployed so they can continue collecting unemployment benefits. But the economics paper Paul cites, according to the economist who wrote it, suggests the opposite of his conclusion. Mrs. Clinton’s support for restoring the emergency unemployment benefits comes as congressional Democrats vow to make the issue a priority in 2014. “Extending unemployment insurance is the right thing to do for millions of Americans who are trying to support their families,” Rep. Debbie Wasserman Schultz (D., Fla.), chairman of the Democratic National Committee, said in a written statement Saturday. She blamed Republicans for preventing Congress from passing an extension of the benefits and warned that if the benefits for the long-term unemployed aren’t extended, the U.S. economic recovery will slow, costing up to 240,000 jobs in 2014. ^^ Well isn't that just special? Now even Hilldog gets to capitalize politically on the GOP's sadistic obsession with reducing the deficit on the backs of the poor and unemployed instead of on the backs of war profiteers and corporate welfare recipients. About 1.3 million of the nation’s 4 million long-term unemployed no longer are getting unemployment benefits. That includes more than 3,700 Kansans and more than 22,600 Missourians who have been out of work for at least 27 weeks, the official definition of long-term joblessness. All extended federal benefits ended last week because the budget deal reached by U.S. Senate and House negotiators didn’t include extension of the federal Emergency Unemployment Compensation program. The added benefits were authorized in 2008 and extended 11 times as the recession and its effects dragged on. Senate Democrats may try to reintroduce the program in January, to provide a three-month extension with retroactive payments, but any attempt is expected to be opposed by Republicans. An additional 2 million unemployment recipients nationally will exhaust their regular state benefits in the first part of 2014 and have no further access to extended federal benefits. Regular state jobless benefits have been capped at 26 weeks in Kansas and 20 weeks in Missouri. As of 2014, Kansas also is capping state benefits at 20 weeks. Because of the recession’s length and depth, some long-term recipients of jobless aid had been eligible to receive up to 99 weeks of aid. But three tiers of extended benefits programs wound down as the economy improved, and the final extensions ceased at the end of 2013. About 4 in 10 of the nation’s 11 million unemployed had been getting either state or federal jobless aid, down from more than 6 in 10 of the unemployed in 2010. With the federal cutoffs, only about 2 in 10 unemployed people will be receiving jobless benefits in January, the lowest share of government assistance since the Labor Department began keeping such records in 1950. As you can see, even the highest reported Democratic disapproval rating is still lower than the lowest reported Republican disapproval rating. And as what has happened (with Republican approval) in recent weeks with regard to both food stamps and extended unemployment benefits begins to have its full effect on literally millions of American families, the aforementioned gap in disapproval ratings will continue to widen in favor of the Democrats. Are Tea Party Republicans so brainwashed and so disconnected from political reality as to actually think they can reverse that trend by arrogantly accusing anyone who dares disagree with their anti-social safety net austerity agenda of being a liberty-hating "socialist" or "collectivist"? If so, then they quite frankly deserve whatever losses they experience in the upcoming mid-term election. GOP Hit on Unemployment Benefits Hurting Americans -- What Else Is New? Out of work "Americans rely on their unemployment benefits to pay for the mortgage or rent, food, and other critical bills. They need our assistance in these difficult times, and we cannot let them down." This is one of the strongest arguments for unemployment benefits ever made by a president. Surprisingly, these words came not from President Obama but from President Bush in a radio address in 2002. Yet his party in Congress almost unanimously ensured that these vital benefits ended last week for 1.3 million Americans and will end for a further 1.9 million Americans in the first six months of 2014. Of the more than 3 million who have been heartlessly cut off from these earned benefits, the greatest number comes from New Jersey, according to a House Ways and Means Committee report. President Bush, who might well be the most conservative president in American history, looks like a progressive compared to today's GOP lawmakers, who are cruelly letting their fellow Americans down. For instance, Sen Rand Paul, a would-be presidential candidate, declared in brutal language that extending benefits beyond 26 weeks -- the program that ended last week extended those benefits for up to 47 weeks -- creates a permanent underclass of Americans. For Paul and most of his colleagues, the reality of still high unemployment is the fault of Americans desperate to work rather than their far-right policies which hamper the American economy. His approach -- and that of most Republicans in Washington -- couldn't be more wrong. Extending unemployment benefits is a lifeline that is needed until these Americans can again find work. I often talk with residents of Jersey City who have been looking for work for much too long. Not once have I been asked for benefits. Rather, I am always asked to help them find a job. That's what they want -- to work. Not one wants the benefits but they need them until they are working again. In other words, the cure isn't the GOP's ruthless medicine. Bluntly stated, the cure is jobs. And, again, that's where the Republicans have it so wrong. Is this really how we want to start the new year, by denying unemployment benefits to more than a million Americans who have lost their jobs? The bipartisan budget agreement passed by Congress and signed by President Barack Obama protects military spending, but promises to throw the most desperate in our economy into increased financial hardship, thrusting hundreds of thousands of families beneath the poverty line. The long-term unemployment rate is at the highest it has been since the second world war, while the percentage of those receiving the benefits is at its historic low. Meanwhile, Wall Street bankers are popping the corks, celebrating a banner year for the stock market. As brokers await their bonuses, many more of the unemployed will head for the breadlines. Jobless benefits are actually stimulative to the economy. Every $1 we provide to someone of unemployment benefits yields $1.60 in economic activity. And that's why the loss of these benefits is going to rob our economy of $41bn. People living on the edge financially spend what they have to get by. Those in the top echelons of our economy, the top 1%, can take their income and hold on to it, or stash it away into an offshore account. The unemployment-insurance program traditionally granted 26 weeks of replacement pay for workers who lost their jobs through no fault of their own. The extended benefits, signed into law by President George W Bush, lengthened the time period to up to 99 weeks. Benefits average just $300 a week. According to the Washington Post, the average job search lasts 35 weeks, so the current 26-week benefit will create added stress on families already struggling. WASHINGTON — To 1.3 million jobless Americans: The Republican Party wishes you a Very Unhappy New Year! It would be one thing if there were a logical reason to cut off unemployment benefits for those who have been out of work the longest. But no such rationale exists. On both economic and moral grounds, extending benefits for the long-term unemployed should have been an automatic bipartisan vote in Congress. It wasn't. Nothing is automatic and bipartisan anymore, not with today's radicalized GOP. In this case, a sensible and humane policy option is hostage to bruised Republican egos and the ideological myth of "makers" versus "takers." Benefits were allowed to expire last week for 1.3 million people who have been unemployed more than six months. Since they have been scraping by on unemployment checks for so long, their financial situations are already precarious, if not dire. Extending unemployment benefits is normally done in a recession; Republicans correctly point out that we are in a recovery. But there was nothing normal about the Great Recession, and there is nothing normal about the Not-So-Great Recovery. Job growth is improving but sluggish, with unemployment hovering at 7 percent, not counting millions who have given up looking. An extension should have been part of the budget deal. Democrats offered an amendment extending benefits for three months, and they identified savings elsewhere to pay for it. But House Speaker John Boehner refused to allow a vote. The nonpartisan Congressional Budget Office estimated that extending long-term unemployment for a year would cost about $25 billion, which would add to the deficit. But the measure would boost economic growth by 0.2 percent and create 200,000 jobs. Given that interest rates are at historical lows and that the imperative now is to create growth and jobs, refusing to extend the benefits is counterproductive and cruel. Sadly, cruelty is the point. The Republican far right perceived the budget deal as a defeat, even though it caps spending for social programs at levels that many Democrats consider appallingly low, because it does not slash Medicare and Social Security. For some in the GOP, accepting an unemployment extension favored by Democrats would have been too much. For some other Republicans, unemployment isn't about spending, growth, deficits or politics. They see it as a moral issue. To them, extended benefits coddle the unemployed, encouraging them to loll around, presumably eating bonbons, rather than pound the streets for any crumbs of work. This view is consistent with the philosophy that Mitt Romney privately espoused during his failed presidential campaign. It sees a growing number of Americans as parasitic "takers" who luxuriate in their dependence on government benefits; 47 percent was the figure Romney came up with. The "makers" who create the nation's wealth are not really helping the down-and-out by giving them financial support to make it through tough times, this philosophy holds. Much better medicine would be a kick in the pants. I wonder if these Ayn Rand ideologues have ever actually met a breadwinner who has gone without a job for more than six months. I wonder if they know that some jobless men and women don't have well-to-do parents or a trust fund to fall back on. I wonder if they understand that unemployment benefits don't even cover basic expenses, much less bonbons. ^^ Now does everyone see why I created the following thread? Democratic leaders in the Senate are planning to fast-track legislation to extend unemployment insurance, a move that would provide a lifeline to more than a million jobless Americans who lost their benefits five days ago. Senator Jack Reed, a Democrat from Rhode Island whose bipartisan bill will ensure a three-month extension of the federal benefits program, told the Guardian the measure would stimulate the economy and alleviate what he called the “mental torment” suffered by those long-term unemployed who now feel abandoned. The benefits, which apply to people who are unemployed for longer than six months, were left to expire on Saturday after a bipartisan budget deal on federal spending for the next two years failed to include a reauthorisation of the program. Reed’s bill, which is co-authored by the Nevada Republican Dean Heller, will only extend the federal benefits until the end of March – a temporary fix designed to allow congressional committees to work on a more permanent solution for the long-term unemployed. It would be applied retroactively, reimbursing those who lost benefits over the last week. In a clear sign that Democrats plan to make poverty and inequality major issues in this year’s Congressional mid-term elections, Harry Reid, the Senate majority leader, told a reporter in his home state of Nevada earlier this week that the bill will be put to a vote when the Senate reconvenes on Monday. ^^ To all you "Tea Party" Republicans in Congress: you just can't stop giving these pro-war/pro-police state/pro-victim disarmament/pro-carbon tax/pro-wage tax/pro-fractional reserve banking control-freaks "left cover," can you? Unemployment checks for 25,000 Washington residents and 1.3 million people around the country ran out on Dec. 28 after Congress didn’t renew extended benefits approved during the Great Recession. After working for 14 years as a billing specialist, Uzorigwe Alintah has not earned a paycheck for a year. He is among many in the Seattle area and one of 4.1 million nationwide — nearly 40 percent of the 10.9 million jobless — who have been unemployed for more than six months. This week, Alintah joined another unenviable group: He is among the millions who are out of work but no longer receiving unemployment benefits. Alintah’s weekly unemployment checks are stopping because Congress didn’t renew emergency aid that had stretched the normal 26 weeks of state benefits by additional 37 weeks. Benefits for 25,000 Washington residents and 1.3 million people around the country ran out on Dec. 28. As a result, only about a quarter of out-of-work Americans are receiving unemployment benefits, the smallest share since such federal record-keeping began in 1950, according to the National Employment Law Project. “I’m worried, you know. How am I going to pay my bills? How am I going to live?” Alintah said Thursday at a round-table in Seattle organized by U.S. Rep. Suzan DelBene, D-Medina. DelBene and her fellow congressional Democrats want to make restoring the expired benefits a political priority as they return from the holiday recess. Senate Democrats are scheduled to hold a vote on a three-month extension Monday. Most Republicans oppose it. They say after nearly six years, the extended aid has lasted long enough and shouldn’t continue without further spending cuts to offset its $25 billion annual tab. Of the 88 co-sponsors of the two bills in the House and the Senate to renew the emergency benefits, only Sen. Dean Heller of Nevada, which has the nation’s highest unemployment rate with 9 percent, is a Republican. Sen. Patty Murray pushed to include extended unemployment aid in the budget agreement she struck with Rep. Paul Ryan of Wisconsin last month, but Republicans rebuffed it. Federal unemployment assistance for 1.3 million people who have been unemployed longer than 26 weeks expired last Saturday, after Republicans blocked efforts to extend them. 3.6 million more people will lose these benefits over this year. Restoring these benefits is a moral, economic and political imperative. On Monday the Senate will hold the first procedural vote on bringing back unemployment benefits for people who have been out of work longer than 26 weeks. The hope is to break a Republican filibuster so the extension can be passed and sent to the House (where Republicans will likely refuse to even allow it to come up for a vote). When the financial crisis hit the country we provided assistance to ("bailed out") the largest banks. We have a moral imperative to also help our fellow citizens. A democracy provides assistance for people who need help. A fair and just society provides assistance for people who need help. A moral society provides assistance for people who need help. The Washington Post put up some interactive maps showing the states where the impact will be felt the most. Note that North Carolina is left out of this map because Republicans there have already cut off unemployment assistance for the long-term unemployed and dramatically cut it for the short-term unemployed. "If a brother or sister is poorly clothed and lacking in daily food, and one of you says to them, 'Go in peace, be warmed and filled,' without giving them the things needed for the body, what good is that?" But the thing is it helps a few people get even richer because high unemployment forces wages down. This fight is also about plutocrats hoping to push people into desperation so they are forced to accept lower wages and poor working conditions. This drives a stake into the heart of the meaning of democracy. There is a political imperative to push for extended unemployment benefits because the American Majority wants this. Senior Republican senators including Mitch McConnell, Marco Rubio and Rand Paul represent some of the states most affected by the controversial cancellation of long-term unemployment benefits, according to a Guardian analysis of data released this week. Democrats, with strong backing from the White House, are orchestrating a major push to restore the benefits, which mostly apply to people who have been searching for work for more than six months. Around 1.3 million people lost unemployment insurance benefits last week, after a bipartisan budget deal on federal spending failed to include a reauthorisation of the program. A further 72,000 job-seekers are expected lose their benefits from Saturday, a rolling tally that will continue through the year. Figures released this week by the Department of Labor, and analysed by House Democrats, provided the first state-by-state breakdown of the first tranche of American job-seekers whose benefits were cut off. The knock-on impact has been estimated to be costing the US economy up to a billion dollars a week. Until now, Democrats have been putting pressure on Republicans from states with the highest overall rate of unemployment. However, Guardian analysis shows that states with the highest flat rates of unemployment have not necessarily been hit the hardest by the benefits cuts. The variable impact can be explained by differences in regional labour markets and ratios of long-term, as opposed to short-term, unemployed, as well as variations in the way states administer the federal benefits program. The result is differences across the country in the proportion of job-seekers who have seen their benefits cut over the last week. Of the 25 worst affected states, most are represented by Democratic senators. However, in addition to the 34 Democratic senators feeling the most pain as a result of of the benefits cuts, there are 16 Republicans. They include high-profile figures such as Rubio, who represents Florida, where 73,000 job-seekers have lost, on average, $231 a week. Four in every 1,000 people lost benefits in Kentucky, which has an 8.2% unemployment rate and is represented by McConnell, the Senate minority leader, and Paul, who like Rubio is considered a potential presidential candidate for 2016. The data is particularly embarrassing for Paul, who in recent weeks has been one of the most visible defenders of the decision to cut the extended jobless benefit programme. Is there anyone in the anti-war/anti-police state/anti-NWO/pro-liberty movement who's as horrified as I am by the thought of Hilldog being our next President? Well guess what? President Hilldog is exactly what we're going to get if a critical mass of infowarriors don't start telling Republicans in general, and "Tea Party" Republicans in particular, to stop taking out of the social safety net budget what they should be taking out of the war, police state and corporate welfare budgets. And if that means telling the Austrian School propaganda machine to go Cheney itself, then so be it! To all you "Tea Party" Republicans in Congress: you just can't stop giving these pro-war/pro-police state/pro-victim disarmament/pro-carbon tax/pro-wage tax/pro-fractional reserve banking control-freaks "left cover," can you? Senate Majority Leader Harry Reid pressed Republicans to support a three-month extension of emergency longer-term unemployment benefits, something Republicans say they could support only if Democrats find a way to pay for it. The Senate is due to vote tomorrow to advance a bill sponsored by Democrat Jack Reed of Rhode Island and Republican Dean Heller of Nevada, though it’s unclear the legislation has the votes to pass. In addition to Heller, Reid would need four more Republican votes for the bill to get Senate approval. “Never with unemployment like this have we even considered not extending them,” Reid, of Nevada, said on CBS’s “Face the Nation” program. 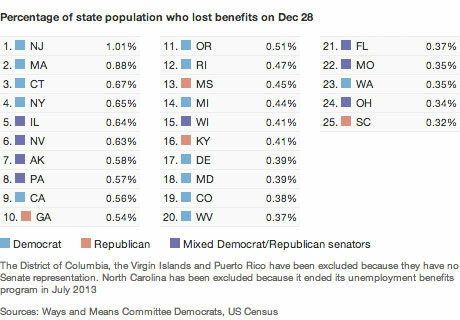 Benefits for the long-term unemployed expired on Dec. 28. The program was intended to help jobless people after they exhausted state benefits, typically lasting six months. Do Republicans not control the U.S. House? Are we supposed to believe that House Republicans weren't aware that there are tens of billions in tax dollars being wasted on corporate welfare subsidies? Are we supposed to believe that House Republicans weren't aware that there are tens of billions in tax dollars being wasted on the drug war? Are we supposed to believe that House Republicans weren't aware that there are hundreds of billions in tax dollars being wasted on imperialist wars of aggression overseas? Are we supposed to believe (or, better yet, ignore) all of that merely because these self-serving reactionaries have wrapped themselves in the flag of "liberty" and "freedom"?? Folks, if you care about the future of your children and grandchildren, this controlled-opposition debate has got to stop, and it has to stop now. A bipartisan plan to once again provide federal unemployment insurance for more than 1 million Americans appears to be falling short of the Republican support needed to clear a key procedural vote scheduled for Monday evening in the Senate. Payments for about 1.3 million out-of-work people expired last month after lawmakers did not extend the program as part of a bipartisan budget agreement. Responding to the concerns of liberal interest groups, Democratic lawmakers and the unemployed, Majority Leader Harry M. Reid (D-Nev.) vowed to hold votes on restarting the benefits as soon as the Senate reconvened in 2014. Supporters are rallying around a proposal by Sens. Jack Reed (D-R.I.) and Dean Heller (R-Nev.) that would provide benefits to eligible workers for three months, at a cost of $6.5 billion. A procedural vote on the plan is expected Monday evening after a vote to confirm Janet Yellen as the new head of the U.S. Federal Reserve. The plan needs at least 60 votes of support to survive a threatened GOP filibuster. With Heller and 55 members of the Senate Democratic caucus, supporters still need at least four votes. But many GOP senators say they will not back extending the program, because Reed and Heller did not outline a way to pay for the billions of dollars in benefits. And even if the proposal passed the Senate, House Republican leaders have expressed no interest in extending the program because the Senate proposal lacks a "pay for." Reed argued in an interview that the short-term extension would not require supplemental cuts because Congress historically has considered unemployment benefits as emergency funding. "Let's get the benefits going for people who need it in difficult times, and then in that three-month period, there's a chance for [lawmakers] to look at longer-term extensions" and find ways to offset the costs of the program, he said in the interview late last week. During a conference call with reporters Sunday, Reed said he is talking to "everyone" about supporting the extension. But Democratic aides said most of the attention is focused on Republican senators whose states are suffering from high unemployment rates: Sens. Lamar Alexander (Tenn.), Saxby Chambliss (Ga.), Bob Corker, (Tenn.), Johnny Isakson (Ga.), Mark Kirk (Ill.), John McCain (Ariz.), Rob Portman (Ohio), Patrick Toomey (Pa.) and Roger Wicker (Miss.). Spokespeople for Alexander, Chambliss, Isakson, Portman and Wicker said Sunday that the senators plan to vote against the Reed-Heller plan because the cost of extending the program isn't offset by spending cuts. Aides to Corker and Kirk said Sunday that they didn't know how the senators planned to vote, while spokespeople for McCain and Toomey didn't respond to requests for comment. OMFG! At first I thought the following story was from The Onion. Can you say, "unintended self-parody"!!?? Fox News contributor Steve Hayes told viewers on "Special Report with Bret Baier" that Republicans have been "a little too wimpy" in the debate over whether to extend emergency unemployment benefits - a debate that was scheduled to be put to a vote on the Senate floor Monday night, until weather-related travel problems forced Senate Majority Leader Harry Reid to push the vote until Tuesday morning. The expired benefits have been consistently renewed since the economy plunged into recession in 2008. While Democrats nearly unanimously support extending the benefits again, some Republicans have voiced opposition to this extension because the current plan doesn't provide for spending cuts elsewhere to make up for the deficit. "They make a very pragmatic, practical argument about deficit neutrality," Hayes said. "I think that's a fine argument, as far as it goes. But I think Republicans are being a little too wimpy on this. I think it's time to make a moral argument against extended unemployment insurance forever." Hayes argued that the benefits, once granted sporadically for dire circumstances, could actually lead to greater unemployment levels and are in danger of effectively becoming an entitlement program. "We’ve been hearing that it'll be cut off now for the better part of five years," Hayes said. "There used to be widespread, bipartisan agreement in Washington that unemployment insurance was sort of the last place to go, the last place that somebody who was down on their luck could turn. Now, it's increasingly becoming a way of life." "What's surprising to me," Hayes added, "is that Republicans aren't making a moral case about how often unemployment insurance that goes on forever leads to more unemployment." How do you improve the economy? If you ask some Republican members of Congress, the best way is to throw 1.3 million people into deeper poverty, starting this week. For some time, right-wing think tanks and conservative politicians have held on to a number of arguments that they believe prove it's a good idea to let unemployment benefits lapse for 1.3 million people. None of those arguments holds up under the least bit of scrutiny. America's economy would be far better off if Congress extended unemployment benefits. To look at their points, one by one, is to understand that the Republican opposition to extending unemployment benefits is dishonest. It also stands to alienate many Republican voters, particularly in the south, where poverty is widespread. That argument may be true in a good economy, but it's false in a rocky one, where there aren't many jobs to go around. The scale of the US unemployment problem is far past the reach of bootstrapping. The US has over 10 million people unemployed, 4 million of them for more than 6 months (what we call the "long-term unemployed"). There are nearly another million people discouraged at being unable to find work, and 8 million others in low-wage, temporary jobs because they can't find full-time work. In short, it is the worst employment market since the recession of the late 1970s and early 1980s. In addition, families, thin on cash, aren't helping each other as much, leaving the unemployed without a private fallback from family and friends. The truth is, "bootstrapping" is not open to everyone. It is determined by class, education (which is often a function of class) and race. Pew Research found that those who "bootstrap" successfully already come from a place of privilege: they are mostly white, college-educated, and in dual-earner families. This is an economy where even a college degree is worth less than it used to be. There are twice as many college graduates working for minimum wage jobs now than 5 years ago. And roughly one out of every eight recent college graduates are unemployed (pdf), according to the Bureau of Labor Statistics. The implication here is that cutting benefits will boost the economy and force people to get jobs. It's a nice fantasy, but it doesn't work out that way. North Carolina tried cutting off benefits six months ago when the state found itself strapped for cash. The result? It wasn't that more people found jobs. Instead, 95,000 people dropped out of the workforce. Net result: an increase in unemployed workers slammed the state's workforce to its lowest level in 37 years, worsening the state's already deep economic inequality. Many Republicans, including House Speaker John Boehner, claim aid to the unemployed should only be extended if the government cuts other programs in order to pay for the additional aid to the jobless. There are three major problems with this. 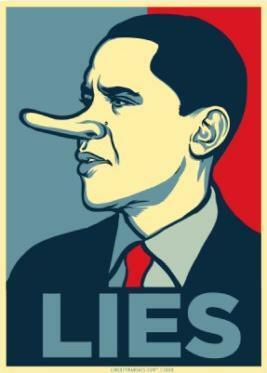 Is it conceivable that the 2014 elections might not prove to be exclusively about Obamacare and nothing else? With the battle over unemployment benefits raging, Dems are increasingly focused on the fact that some House Republicans expected to oppose an extension under any circumstances — no matter what “pay for” is agreed to — are also running for Senate. Phil Gingrey, Paul Broun, and Jack Kingston have turned their backs on Georgians looking for work and it’s costing Georgia’s economy millions. Gingrey, Broun, and Kingston have all opposed extending critical unemployment insurance in the past for Georgians looking for work. That kind of irresponsible economic ideology caused 54,400 Georgians to lose critical assistance on December 28. It’s not yet clear how House Republicans will handle the current extension. GOP leaders have said they are open to the extension if it’s paid for and coupled with a GOP job creation measure. But it’s difficult to imagine any circumstances under which House conservatives support an extension, since groups such as Heritage Action have come out against it even if it’s paid for. You can imagine this becoming an issue in GOP primaries, making a Yes vote even harder. It’s also possible that the Senate will fail to pass an extension, in which case the GOP-controlled House will probably not act at all — an outcome that will also be used against House GOPers running for Senate. When I say that the Republican Party's ridiculous obsession with taking out of the social safety net budget what they should be taking out of the war, police state and corporate welfare budgets is only helping pro-war/pro-police state/pro-fractional reserve banking/pro-Wall Street Democrats politically by giving them "left cover," I'm not doing so just to hear myself talk. I'm trying to draw attention to a political reality about which an alarming percentage of conservatives and right-leaning libertarians seem to be in willful denial -- a reality that, if gone unrecognized and unaddressed much longer, will likely result in Obama Democrats taking back control of the House by default later this year, and in Hilldog winning the Presidency by default in 2016. Is that what you want? In a White House speech Thursday promoting his supposed offensive against inequality, President Barack Obama will formally name five communities as so-called “promise zones.” The White House on Wednesday released a statement identifying impoverished neighborhoods in Philadelphia, Los Angeles and San Antonio, as well as Southeastern Kentucky and the Choctaw Nation of Oklahoma, as the first such zones. Another fifteen regions are to be designated in the coming months. In an attempt to lend an aura of progressive reform to the measures it is proposing, the administration scheduled the speech for the week of the 50th anniversary of Lyndon Johnson’s declaration of a “War on Poverty.” Besides the “promise zones,” these measures include a restoration of three months of jobless benefits for the long-term unemployed and a small increase in the federal minimum wage. The counterposition of these paltry proposals to the last significant social reforms in the US, including Medicare, Medicaid and food stamps, only underscores the repudiation by the political establishment and both big business parties of social reform and their joint drive to dismantle the reforms of the past. Obama’s claims to be fighting inequality are belied not only by his past record, but by the further attacks on the working class he is presently pursuing. The White House and the Democratic Party are cynically seeking to use the Christmas-time expiration of benefits for 1.3 million long-term unemployed workers, which they engineered by dropping an extension from the two-year budget deal they negotiated with the Republicans, to attack the Republicans and posture as advocates of working and poor people in advance of the 2014 midterm elections. The Democrats have already indicated they will agree to new social cuts elsewhere in exchange for Republican acceptance of a mere 90-day extension of the benefits. The increase in the minimum wage to $10.10 an hour being advanced by the Democrats would leave the base wage, in real terms, lower than it was in the 1960s. This compares to the trillions of dollars handed over to the banks and corporations in the form of taxpayer bailouts and the tens of billions in monthly subsidies to the financial markets provided by the Federal Reserve Board. The Democratic-controlled Senate this week ensured the continuation of this policy by handily confirming Obama’s nominee and Wall Street’s pick, Janet Yellen, to succeed Ben Bernanke as the next Fed chairman. Obama’s singled-minded focus on covering the bad bets of Wall Street and further enriching the financial elite, in part by driving stock prices and corporate profits to record highs, has fueled a staggering increase in social inequality. The total wealth of billionaires has more than doubled since the stock market hit bottom in March of 2009. Since then, the Standard & Poor’s 500 stock index has risen by 170 percent. More than 95 percent of all income gains in the US during Obama’s first term went to the richest 1 percent of the country. The story of the morning is that Republican Senators who are inclined to support an extension of unemployment benefits may not do so because of procedural reasons. The broader tale here, however, is that more Republicans seem to be searching for reasons to oppose the UI extension that aren’t rooted in ideological opposition. Initially, Republicans such as Rand Paul were outspoken in arguing an extension would do a disservice to the jobless – Paul Ryan’s Hammock Theory of Poverty. Senator Paul subsequently shifted, and other Republican Senators said their objection was to a lack of an offset, though just enough supported a three-month extension to get it past cloture. Now that Dems have offered a pay-for on an 11-month extension, Republicans are citing procedural objections. If progress against poverty has nonetheless been disappointingly slow — which it has — blame rests not with the poor but with a changing labor market, one that no longer offers good wages to ordinary workers…the problem of poverty has become part of the broader problem of rising income inequality, of an economy in which all the fruits of growth seem to go to a small elite, leaving everyone else behind. So how should we respond to this reality? The conservative position, essentially, is that we shouldn’t respond…for decades their position was a political winner, because middle-class Americans saw “welfare” as something that Those People got but they didn’t. But that was then…hard times have forced many more Americans to turn to safety-net programs. And as conservatives have responded by defining an ever-growing fraction of the population as morally unworthy “takers” — a quarter, a third, 47 percent, whatever — they have made themselves look callous and meanspirited. You can see the new political dynamics at work in the fight over aid to the unemployed. Republicans are still opposed to extended benefits, despite high long-term unemployment. But they have, revealingly, changed their arguments. Suddenly, it’s not about forcing those lazy bums to find jobs; it’s about fiscal responsibility. And nobody believes a word of it. Look at this from another angle. Republicans looking to mitigate political damage in the UI fight have another play in addition to complaining about fiscal responsibility: They think they can win the politics of it by citing the need for an extension itself as an indictment of the Obama economy. But this strategy seems rooted in a failure to appreciate that many voters see the current economic situation as something extraordinary, as the cause of multiple long running trends that are tilting the playing field against working and middle class Americans. These views of the economy seem to be what are driving rising concerns about inequality, and a majority of the American people want government policies that do something about it. Yet Republicans seem to think they can get muddle through the UI battle with a combination of protestations about fiscal responsibility and blame directed at Obama for the plight of the jobless, a political argument that already failed in 2012. President Obama, announcing his so-called “economic promise zone” initiative in a White House speech on Thursday, gave a performance that expressed the cynical and contemptuous attitude of his administration and the entire ruling class to the plight of working people in America. The event was staged as part of the administration’s supposed campaign against inequality, whose entire substance, besides the “promise zones,” consists of a call to restore long-term unemployment benefits and enact a small increase in the minimum wage. Speaking in the midst of the deepest economic crisis since the Great Depression, with the poverty rate rising and social inequality at historic levels, Obama made no attempt to present an objective picture of the social crisis in America. He offered no statistics on poverty, unemployment, hunger or the vast chasm separating the financial elite from the rest of the population. Nor did he attempt to explain why the social crisis had worsened during his tenure. His remarks were perfunctory, off-the-cuff and punctuated by jokes. He gave no concrete details about the five “promise zones” he was announcing—in impoverished neighborhoods of Philadelphia, Los Angeles and San Antonio, and in Southeastern Kentucky and the Choctaw Nation of Oklahoma. 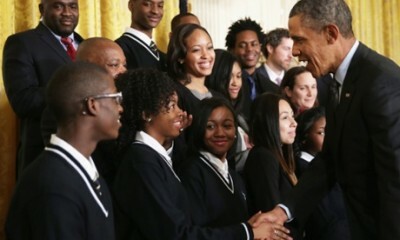 Obama noted the presence of the Republican senators from Kentucky, Rand Paul and Mitch McConnell. Paul, who is ranked as one of the most conservative Republicans in Congress by the Heritage Action Network, told Fox News that Obama’s “promise zones” resembled his own proposal to set up low-tax “economic freedom zones” throughout the US. “They say the sincerest form of flattery is in imitation,” Paul quipped. Obama avoided any criticism of the corporate-financial elite, which has exploited the economic crisis to drive down wages, increase speedup and generate record profits and CEO pay. He went out of his way to make clear that his initiative was business-friendly. “This month I’m going to host CEOs here at the White House, not once, but twice,” he said. Obama opened his remarks by invoking Lyndon Johnson’s January 1964 call for the eradication of poverty and joblessness, noting, “It is now fifty years since President Johnson proclaimed an unconditional war on poverty in America.” At the time, Johnson called the elimination of poverty a test of the capitalist system. Yet the current president said nothing about the failure of that system to come anywhere near putting an end to poverty. Obama gave his speech the same day the Census Bureau reported that in the first three years of his presidency, nearly one third of the country’s population, 31.6 percent, fell below the federal poverty line for at least two months. He spoke even as his administration was intensifying the austerity policies that had inflicted pain and deprivation on tens of millions of Americans. It was widely reported Thursday that congressional Democrats had agreed to cut $9 billion in food stamp benefits on top of the $5 billion cut that was implemented last November. The White House’s rhetorical pivot on inequality coincides with an administration-backed budget deal that leaves in place over a trillion dollars in sequester cuts while slashing federal workers’ retirement benefits and imposing regressive consumption taxes. The administration has backed the plans of Detroit Emergency Manager Kevyn Orr to use bankruptcy to slash the retirement and health benefits of city workers and sell off the artwork at the Detroit Institute of Arts. Meanwhile, the Affordable Care Act, popularly known as Obamacare, is being exposed every day as a scam to slash health benefits for tens of millions of Americans and boost the profits of insurance and health industry corporations. It is the first step in an assault on the key social programs—Social Security and Medicare—that Obama cynically invokes for public consumption, even as he plots with the Republicans to cut and ultimately privatize. The declared focus on social inequality is a marketing strategy aimed at rehabilitating the image of the Obama administration amid growing popular anger over its right-wing social policies, its illegal domestic spying programs, and its foreign policy of militarism and war. The phony campaign is being coordinated with the trade unions, in conjunction with their fast food protests and lobbying for a rise in the minimum wage, backed by the allies of the union bureaucracy in liberal and pseudo-left circles. By means of this ruse, the Democrats hope to bolster their chances in the 2014 midterm elections and hold back the growth of working class opposition. “Poverty,” reports the New York Times, “is suddenly the subject of bipartisan embrace.” Before poor people get too excited about this new development, some clarification may be in order. The parties are not embracing a shared program to alleviate poverty, nor even the goal of doing something at all about poverty anytime soon. There is merely shared agreement to discuss poverty as a subject. The near-term agenda remains completely unaltered. Republicans remain unified in their desire to cut food stamps and end emergency unemployment benefits unless offset by other cuts to domestic spending. Nearly all support ongoing state-based campaigns to deny Medicaid coverage to uninsured people too poor to qualify for tax credits to buy private insurance. The awkwardness of the current moment is that Republicans have yet to agree on any kind of alternative policy framework for anti-poverty policy, and in the meantime they are still waging a current legislative fight to roll back existing income support for the poor and block a minimum-wage increase. When forced to defend these positions, they are making the odd argument that being poor stinks. “You don’t dream when you’ve got food stamps,” says Paul Ryan. Neither can you dream when you’re collecting UI: “Even if you had an extension for three months, what are you doing to solve the broad picture of the economy and creating jobs,” said Senator Jerry Moran. For that matter, even low-wage jobs are no picnic, either. “Raising the minimum wage may poll well, but having a job that pays $10 an hour is not the American dream,” says Marco Rubio. It is certainly true that being unemployed, or poor enough to qualify for food stamps, or making the minimum wage is no fun. Everybody agrees that faster economic growth, low unemployment, and higher wages would make people happier than being poor. The question is, given the actual labor market, why would withholding benefits from unemployed workers create jobs when jobs are so scarce? Few Republicans care to address that question straightforwardly.